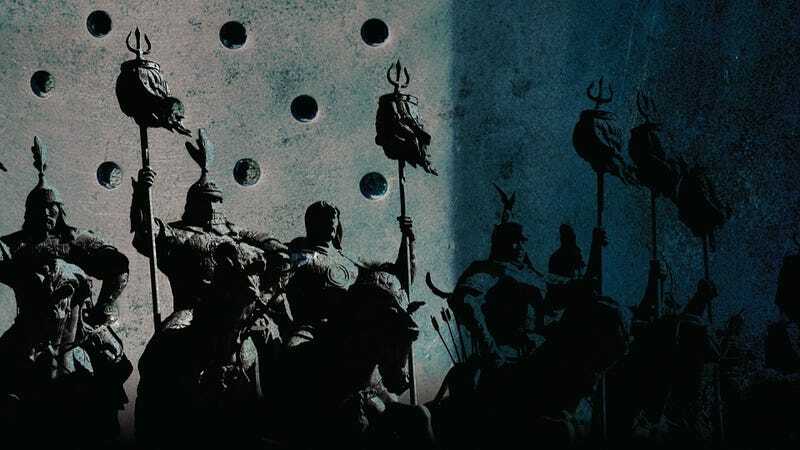 A group of knights travel East towards the lands of the Mongols, in an exclusive excerpt from The Mongoliad Part 1, the group novel spear-headed by Neal Stephenson and Greg Bear. In this selection from chapter 7, the mysterious knight Istvan seems to know more about the Mongols than he's been letting on — and he seems to have a secret agenda, as well. The Mongoliad Part 1 is written by Stephenson, Bear, Joseph Brassey, E.J. deBirmingham, Cooper Moo, Erik Bear and Mark Teppo, and it comes out next Tuesday from 47North. They stayed away from the known routes, and after a few days they entered a dense forest of great oaks, oaks old enough to revive a deep sense of reverence in Cnán and keep the knights more than usually quiet. Cnán remembered these trees had been sacred to the Slavic war god, Perun, now fled (or tempered) by the Greek Christos. The high-arching green branches reduced what little sunlight passed through the thick, eastward-sweeping clouds to a few silvery shafts, and as the summer rains began, water dripped constantly from the leaves, leaving the litter boggy and the horses moody. Cnán watched the riders, both as they traveled and as they pitched their spare camps in forest and field. She studied the knights' interactions with their leader, Feronantus, and closely observed each member of the party, as her mother had taught her. "We study all men as we would the beasts. Thus, we know them better, and they learn nothing of us," her mother had said. "No one has known our people, nor will they ever." The eleven travelers in turn paid her little attention. They now seemed to regard her as an irritating little sister, or perhaps a dog, if they thought of her at all. She liked being ignored, even by Percival, who had never shown her much interest anyway. As they rode between the big oaks, at the prompting of Feronantus, the group spread out thirty or forty paces and assumed a loose double V, such that whatever foes they met could easily be drawn into a fork by simple sweeps one way or another. Cnán often moved off from the main body, reconnoitering, scouting for war parties or any of the stray, crazed, bloody-minded fragments of dying armies-whatever might have scattered over this broad, flat portion of the Empire of the Great Khan. She also looked for the signals and cryptic marks left by other travelers-and in particular, Binders. Knotted cords and an array of marks had guided her from the east in the first place. When they weren't tying knots, Binders left messages by looping sapling branches around thicker limbs, notching big trees near the base, or draping anonymous, cleverly torn shreds of bog-dyed brown cloth. On occasion, if the skeleton of an animal (or a human) presented itself, messages could be left in the apparent scatter of gnawed ribs. Larger marks scored in the dirt or arranged in rocks could be seen only from high up in trees-still others were obvious only in winter. Travelers from other societies worked their own signs into the far-stretching earth. Along her paths east and west, traveling with her mother as a child and with other Binders, or alone, she had noticed long lines of tight circles cleared with sticks from the litter and grass. Binders could not read them, and the lines couldn't have lasted more than a few seasons, yet they were always there-as if magically renewed. Together, travelers from all the societies were leaving their itineraries, and their maps, where no roads had yet been laid. Some of those marks had been maintained for thousands of years, not just by guilds and traveling societies but by loosely-allied foragers and hunters who rarely met in person. The knight who best understood the secret languages of stones and circles was Istvan, of the dour countenance and immense mustache. Cnán undertook several times to observe him as he, too, rode away from the party on private forays, despite Feronantus's concern. She kept well away and took care not to fall under his eye, but on occasion, found means to hide near a path she guessed he would take. Istvan was moody, his usual expression a scowl of focused attention-or just a scowl. Like many who had survived the advance of the Mongol Horde, he had seen too much that he could not clear from his memory. On the tenth day of their journey, Istvan caused her a deeper concern — for two reasons. Clearly, the refugee knight of Mohi was less interested in traveling east at speed and more interested in old camps, old huts, deserted farms, and what few hamlets could still be found burrowed deep in the forests. Several times, he stopped at these rude, threadbare communities, at no pains to conceal his identity or his character, and asked questions about Mongols. He seemed to understand many of the dialects here, occasionally Teutonic, more often variations on Slavic Ruthenian, and sometimes, in the deep woods and tall hills, a tongue very similar to his native Madjar. Istvan also seemed to have more than a passing acquaintance with the pathways of goods, slaves, and money in conquered territories — and he knew much more about Mongols and their eastern allies than he let on in camp, where he usually kept silent. Istvan's interest in old farms was not just a matter of military tactics, Cnán began to realize. He frequently paused to dismount in abandoned pastures choked by ivy and creepers, to part the overgrowth and dig his fingers into the soil beneath. For Istvan's other quest — and this fascinated Cnán — concerned mushrooms. Sometimes he collected the small mushrooms that grew in those soils, dropping them like gold coins, one by one, into a loose-woven linen bag. Cnán became convinced that Istvan-in contrast to Raphael, who sought out and preserved many herbal simples-was following the nearly invisible petroglyphs and tree arrangements of the ancients: goddess-worshippers, Orphics, Earth and sky mantics-signs of which Cnán, truth be told, knew very little. She had seen none of that sort of activity in her lifetime. Binders, however, knew something about the mushrooms used by these ecstatics. At times, adept guides collected them on their travels and purveyed them to temples and priests throughout greater Asia, but she was not familiar with their use in these territories, and wondered how and why Istvan had acquired his expertise. He avoided the red-and-white amanitas, and well he might. Their use was often deadly. The smaller wavy-cap and freebuttons and other mushrooms were far more interesting and complex-or so Cnán had heard. On the fifteenth day, she saw him emerge from a wet, grassy clearing. He paused, opened his bag, and popped a freshly-harvested freebutton into his mouth, making a bitter face. He climbed back on his patient horse and sat mounted for a while, not moving, but looking left and right, up and down, before drawing in the slack of the reins and lightly kicking the horse's girth. His path back to the main group did not waver, but he was unusually silent in camp that night, staying awake and looking up at the wet leaves as the others slept. His scowl eased, his mustache drooped almost to his chest, and he seemed remarkably at peace. Freebuttons and wavy-faces carried old demons with tricky ways. Swallowing them was not for the uninitiated, and never for those suffering the way Istvan suffered. Sometimes the demons in the mushrooms would befriend internal devils and soothe them, but that, she guessed, was not his main reason for gathering them. In the far east, freebuttons were sometimes chewed by warriors intent on going into battle in a highly focused, emotionless, killing rage. Some called it putting on the Bear Skin. Feronantus would have called them Berserkers. On the thirtieth day, on the night of a full moon, under a starry sky, Cnán stumbled over some of Istvan's handiwork. She had moved north nine verst, planning to head back to the main group that night. The woods and the undergrowth were thick enough that she was obliged to use established trails. Deep down one of these, she had been cut off by a band of Tartars escorting a man dressed in a coat thick with swaying sables. He wore a shining black helmet without a visor, and his features were darker, almost blue-black. He was long-nosed and sharp-chinned, handsome in his way, and she thought he might be from the southeast, the transmontane lands beyond Tufan, warm and humid places that Alexander had long ago thrust into, even now being stormed by the Mongols. The presence of this sable-hung merchant alarmed her. Cnán had striven to guide the knights away from main-traveled roads, to avoid confrontations, speed them along, and let them keep their strength for their main purpose-crazy as that purpose might be. But now that might be impossible. She tracked this orderly and quiet band and soon understood their purpose: collecting furs from itinerant trappers. Furs were coin of the realm in these parts, and Mongols had traded them for many centuries. Peoples on the fur routes often used cut-up pieces of sable and mink as earnest of additional reserves-like bills of exchange, only more representative and tangible. The whole, uncured furs were strung on cords like drying fish and hung off the backs of the sumpter horses, or piled on top, or, as with this merchant, safely stitched to the owner's coat. Along the edge of a small lake, where the old oak forests had given way to meadows and young birch, the merchant and his guards approached a thin column of smoke, and there, beside a small, open campfire, bargained with the eldest of a small band of trappers — a wizened brown man who spoke Georgic and Slav, but no Mongol. He was closely attended by three swart, thick-bodied boys: possibly his sons. After taking his pick of their finest furs, the sable-coated southerner ordered that some of his own goods be removed from the pack animals and disbursed to the trappers-dried venison and several ceramic jugs. There followed a round of toasts, and then the merchant and his guards departed. Soon the trappers were happily drunk, and, as dusk settled, they curled up on the lakeshore, letting their fire go out. Cnán hoped to follow the merchant until the last of the daylight, at which point she would build a lean-to and sleep until dawn. But before that time arrived, from her grassy cover, she heard a single, awful scream. Then shouts, rising to cries, each snuffed out in its turn. The fur-trader and his company heard the commotion as well. As she watched from her cover, they bunched together on the periphery of a grassy meadow, murmuring among themselves. Soon, they decided it was best to move along-no doubt making note that bandits were about. But Cnán suspected this was no bandit. She doubled back to the trappers' camp and found the entire group pieced out along the lakeshore. Two of the younger men sprawled on the ground, a hundred paces or more from the cinders of the campfire, each at the end of a long trail of blood. Both had been shot with arrows that had since been collected, presumably by the assassin who had shot them. Closer to the camp, the third young man had taken an arrow up through his neck, passing into his skull, where it had lodged so deeply that its owner had snapped it in half in a furious effort to worry it loose. Its bloody empennage lay discarded on the ground nearby, and Cnán recognized the fletches of grey goose feathers that Istvan liked to use. The elder's death had been quick — a single slice across his throat had nearly severed his head — but he had then been hacked and kicked about, limbs and chunks of flesh mixed with the reeking shards of the jugs. The entire camp smelled of old man's blood and thick, sweet Georgian wine. She knew the hoof marks of the horse that had wandered down to the lakeshore to drink while her master did his filthy work. It was Istvan's blue roan stallion. That horse and his rider were now moving northwest, hunting the fur traders.